The Hoku (means star) is an upstairs spacious air-conditioned studio with a full kitchen and a small bedroom. It consists of a Lexington Furniture Tommy Bahama queen sized bed ideally suited for a romantic couple. 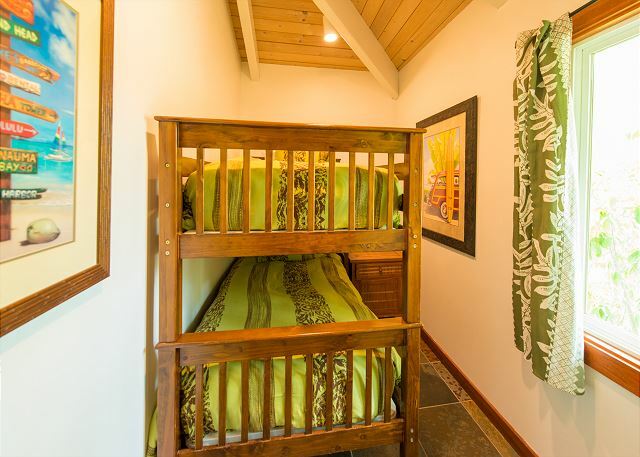 The small bedroom has a twin bunk bed and a queen sized sofa bed in living area. The bungalow is tastefully decorated with tropical themes. 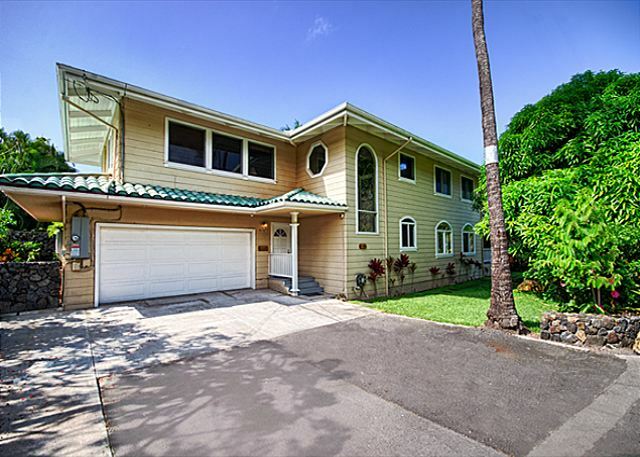 Conveniently located 2.3 mile south of downtown Kailua-Kona pier, 1 mile from town and 10 miles south of Honokohau Boat Harbor. 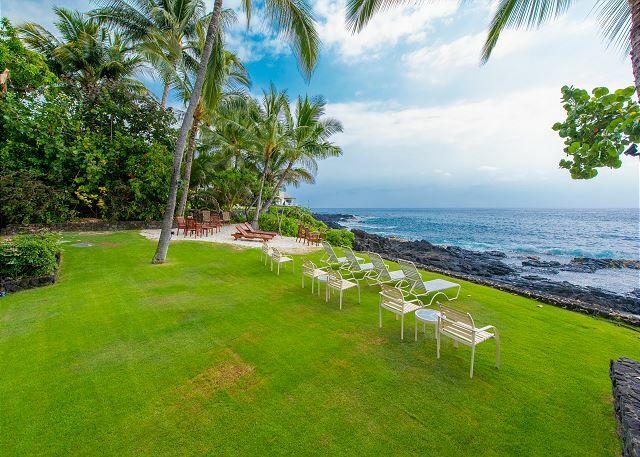 Hale Hoku, is located within the unique, private and gated Kona Beach Bungalows Estate. 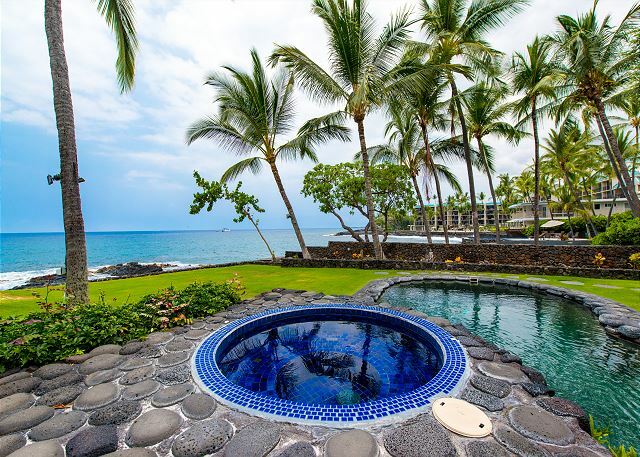 This Estate is considered the only private, oceanfront, vacation rental Estate on the Big Island of Hawaii and can accommodate up to 34 people. (15 Bedrooms and 11 baths). The homes, all on the same Estate, can be rented out separately for couples or family getaways as well. 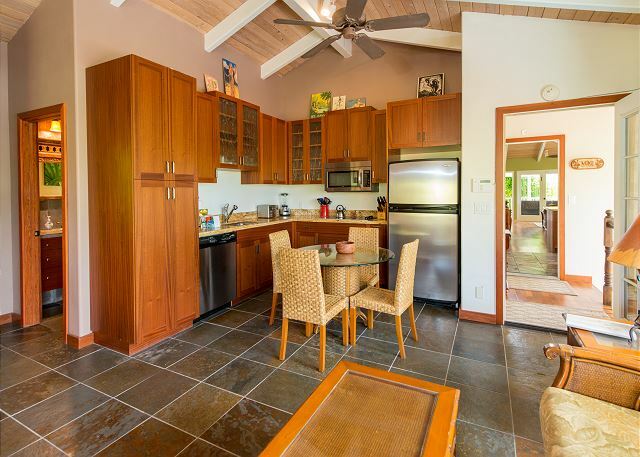 All of the beautiful bungalows share the estate’s common grounds, the lava rock saltwater pool and Jacuzzi, lushly landscaped yard overlooking the Pacific Ocean, enchanting koi ponds and barbecue grills. Nearby, you will find Hawaii's best scuba diving, big-game fishing, kayaking, dolphin and whale watching and other ocean activities. 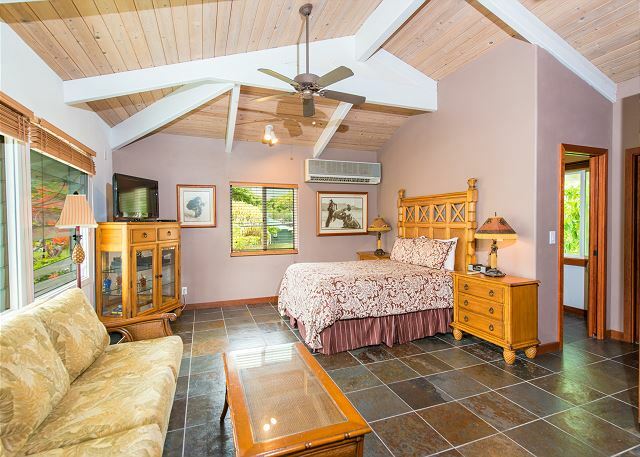 Minutes to a wide assortment of restaurants and shopping, and a great home base to explore the many wonders of the island including Volcano National Park, Mauna Kea Observatory, coffee and macadamia nut farms, artist communities, and more! Down the street are snorkel and surf beaches. Very close to town and activities, seconds from the shoreline, just a short walk to watch turtles, surfers and beautiful sunsets. Walk across the street to the 'Alii Gardens Market Place'. Here you can find handmade gifts and local produce. Marjorie F from Edmonds, WA does not recommend this vacation rental. The property itself is lovely - the small part that has the pool and faces the ocean. The big house fronts this and would be a good place to stay. However, the other 4 "bungalows" on the property are behind the big house and have no view. Their access to the waterfront is a narrow path beside the big house. If you rented the whole property and people could come through the big house to the waterfront, it would be fine. We were surprised to discover that the term "bungalow" referred to apartments in a building with 3 units, two being up steep stairs. With just my husband and myself, we rented the 1 BR and found we had a view - and noise - of the main road. We stay in condos several times a year every year and have never seen one with so few dishes and general supplies. However, the appliances were good quality. The location is OK if you plan to drive to places. Walking is not a good option since the road is quite busy and there are no sidewalks. We rented the Hale Moana house for our 50th Wedding Anniversary and brought our children to Hawaii to celebrate with us. Also rented an additional property on site. Beautiful venue. Very well appointed. A memorable experience for the family. This property was remarkably well outfitted and clean, with top of the line finishes. 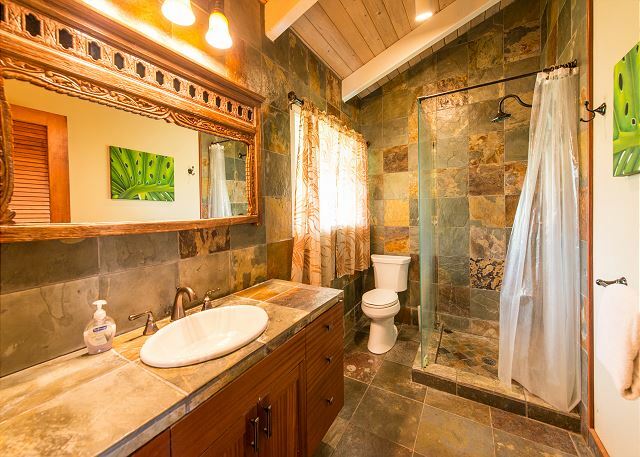 The owner clearly put a lot of thought into the details, and it was very deluxe! 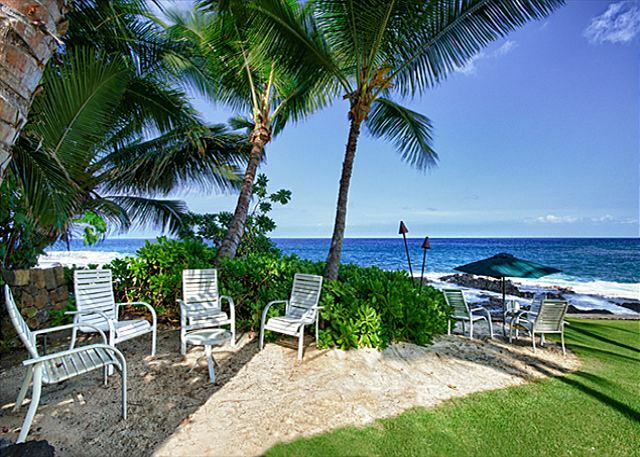 While this particular unit is not oceanfront, nor does it have a view, it is a very short walk thru gorgeous tropical landscaping to get to the front of the property, where a spectacular ocean front lava rock Jacuzzi and salt-water pool are shared by just the 5 units on the property. A wonderful spot to enjoy watching the surf and sunsets! The garage is also well outfitted with a full size washer/dryer for guest use, as well as picnic and beach supplies. Also (for the golfers) several sets of matched clubs. Wish we'd known that before paying to lug ours over - great bonus to a wonderful spot in paradise! We had 4 bungalows for a week enjoyed with family.